Free clip art and stock photography websites: There are many websites where you can find free images to use in your projects. A good place to start for clipart is FCIT’s Clipart ETC website. You can use up to 50 images from this site in a single non-commercial project without requiring permission. The Clipart ETC website has more than 8,500 items to choose from, in a variety of sizes and formats. If you are doing a project that requires photos with a Florida theme, you may want to check out the Exploring Florida section of the FCIT website. You can use up to 20 photos from this section in any individual non-commercial project. There are many other free stock photography websites. Two popular ones are Stock.xchng and Morguefile. These sites often catalogue images uploaded by amateur photographers and make them available with no copyright restrictions. 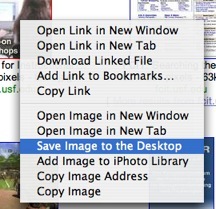 Other websites: Your can right click on any image you find on a website and select Save Image to the Desktop (or a similar command depending on which web browser you use) to store it on your hard drive. 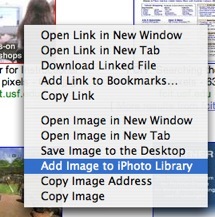 In some versions of OS X you can also import the image directly into iPhoto while you’re visiting a webpage by control-clicking (or right-clicking) on it and selecting Add Image to iPhoto Library.